I am Anke Meuwissen. I received this wonderful present from my friend Aaron. On March 30, 2018, we had to let go of our sweet chestnut with pain in our hearts during the operation of gas colic. I have always said that I really wanted to have something special created of my chestnut, but never really did. When she was still there and I could still see her every day so it was never a priority. I never thought that the day I could not see her would come so quickly. Cadence my chestnut, stubborn, sweet and ever so reliable mare was everything to me. She was 4 years old when she came to us and with less than 11 years she already passed away. Aaron knew that it would be a huge consolation for me to really have something special created of 'my chestnut. I have followed Mirelle on Facebook for a long time and found her work to be special. She knows how to convey the feeling of her work very well. I found this very important. I wanted Cadence to come into her own and I could really see / feel her again if I looked at the work. This is why I really wanted to have Mirelle do it. Aaron knew this and approached her as a surprise for me. She has taken us / involved us in the process from start to finish. Every time she sent an update, it was WOW! How does she do this? The result is even better than I thought. The way she is portrait and the look in her eye is correct, it's exactly Cadence. She has been given a special place in our living room. I still miss her every day, but when I look at the drawing, the beautiful memories of her always come flooding back. I am very grateful to Mirelle for the wonderful work she has done for us. I also want to immortalise my first pony in this way. First save up, then I will definitely ask Mirelle if she wants to do this for us! I did not experience the process from start to finish because it was a gift from a very good friend. Mirelle came by to see my dog and started the work after that. Never had I dared to dream that he would become so beautiful. I am incredibly grateful that she has done this with so much passion and love. Dear Mirelle, thank you for portraying him so beautifully and so real! How did I experience the cooperation with Mirelle? Mirelle is a very sweet woman, honest and open. The collaboration was really fantastic. I approached her for my first painting one day after I had to put Ukkie to sleep. She immediately took action! She was with me at my home in no time at all. During the creation of the paintings, I regularly received pictures on it's progress. She did ask for a deposit but that is only logical, since in these days trust is hard to find. But Mirelle kept herself perfectly to our agreements! Believe that we agreed on a time frame of 1 year because you have to be in a 'flow' to create. But I find personally that creating an artwork should not be done in a hurry. What is the result of my commission to Mirelle? That Ukkie was painted, I thought wowwww it's really him! Exactly who my horse used to be. He proudly resides at our home now, as if he is still with us. Also, when I went to pick up Ukkie, I asked if Mirelle wanted to paint our other 2 horses as well. That was obviously no problem! We did a photo shoot with Nikki the Kerf, so you have really excellent reference material to get her started. 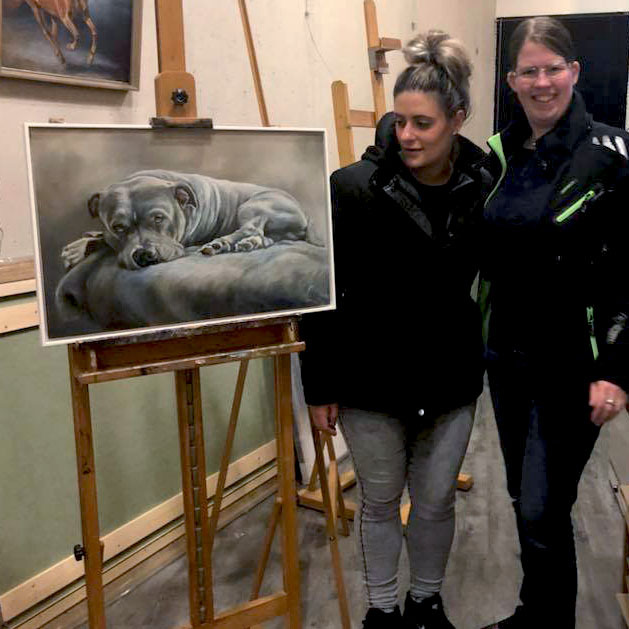 The pictures are fantastic, resulting in 2 fantastic paintings of Miss & Voa. Also these 2 girls are residing proudly at their home, these mare are yet still with us tho. Would I recommend Mirelle to others and why? Yes, absolutely, she is sweet and honest! I think that is very important. And lots of aspects of the commission are open to discussion, so that is also very nice. The job she does is just extraordinary. Real craftsmanship. I can not even draw a stick figure, let alone paint a horse. You really should want a pretty handsome painting of your (best) friend, it will last forever. Life is not infinite. It is seriously worth it doing business with Mirelle! I am Amanda van Nijnatten and have made my hobby into my work. I am self employed in the equestrian sport. I also have two horses of my own with whom I ride professional dressage quite enthusiastically. 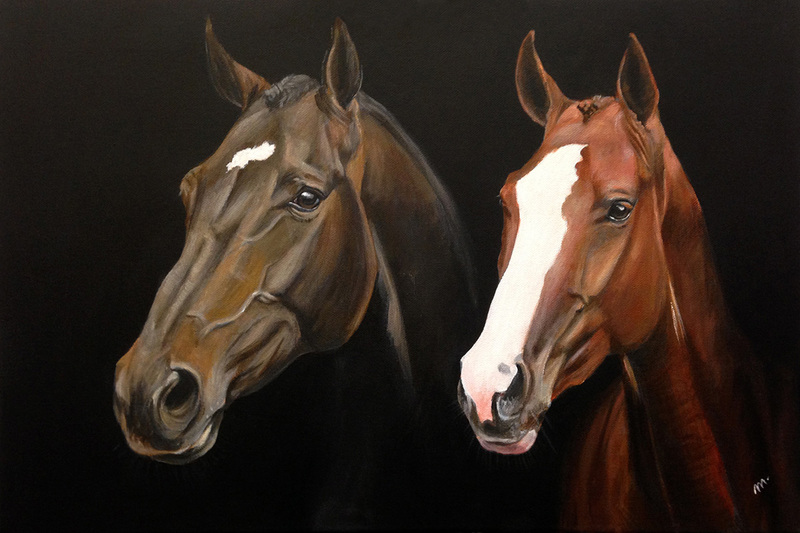 I wanted very much my first own bred horse Querqus (who unfortunately is no longer with us, he died at the age of 9 cause of an injury) and my other cracker Fagus (also half-sister of Quercus and bred myself) beautifully portrait together onto one canvas. And it has become beautiful! I'm still madely in love with the artwork and it's a wonderful memory of my deceased horse (on the left). I am delighted to wake up seeing the artwork every morning when I wake up and can look forward to looking at it every night before I go to sleep. My experience was very good. Mirelle is personal and very professional. I was very pleased that she came by our house and listened my story. She came by the stables as well to meet with Quercus before I had to put him to sleep the next day. I received pictures of the progress on the artwork. And after that the end result of course. That was very special, an artwork is really something totally different from a picture! And to this day the painting is still beautiful. I am so happy with my two fantastic friends united onto one canvas to this very day! I am Joyce van Eggelen, I am a qualified equestrian riding instructor and employee at the Dutch postal service. I've been thinking for a long time how I wanted to remember my deceased horse. I felt a photograph was not special enough and a painting wouldn't fit nicely in my interior. 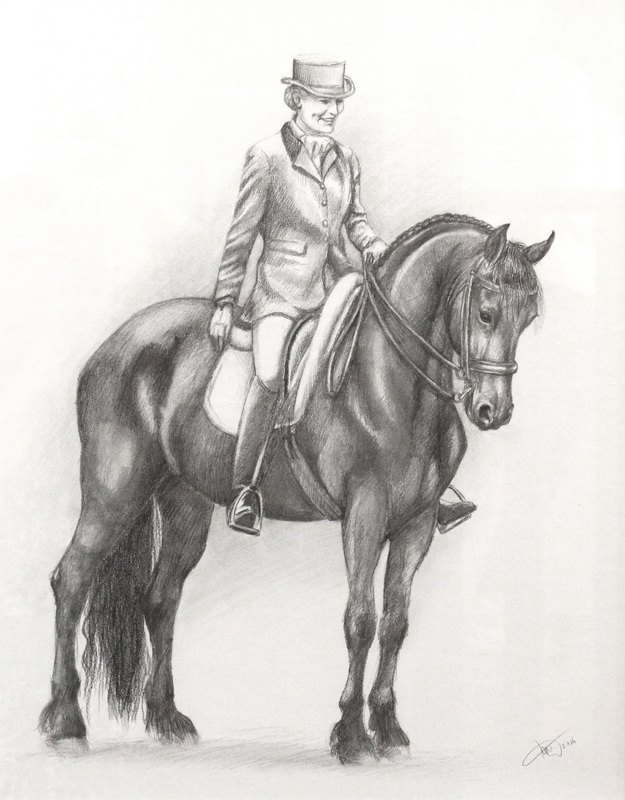 That's why I wanted to have a drawing created of my dear friend and mate, my horse Tinus. Through Facebook I had already seen several portraits made by Mirelle. I was very impressed. I also decided to approach her and we made an appointment. When I came to her studio, I immediately had a very good feeling after we got acquainted. After I admired her paintings and drawings, I became very doubtful. What did I really want? A drawing or a painting, it was so difficult to make a choice! I thought about it for a long time, but something told me that my horse Tinus would be best shown when he would be drawn in graphite. We decided on a drawing and I got very excited! So many thoughts went through my head, would it really be him? Would I even like the artwork? Oh, it what so exciting! The end result was amazing, also because Mirelle would email every now and then to show pictures of the progress of the drawing so that I could provide feedback. We were really in tears when she unveiled the portrait. The artwork of Tinus is now on display in the living room. I finally feel that he is still with us. It is a very striking portrait. We are very happy with it and we only receive positive comments! Thomas: We are Sanne and Thomas van Heel. We have our own equestrian stable in Oijen (near Oss). We breed jump and eventing horses. And we ride these horses in competitions. 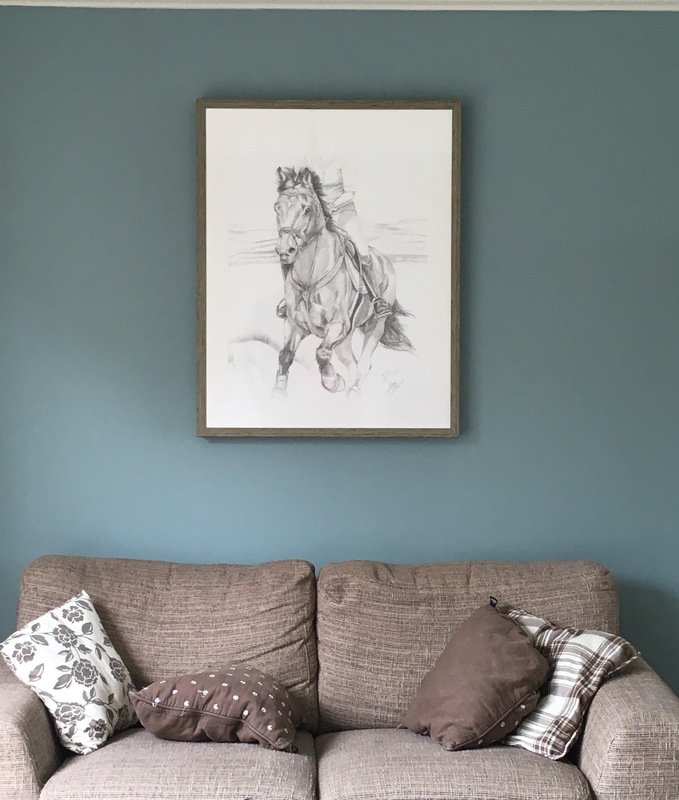 We wanted a portrait of one of our horses, Zyraldine, because we have a special connection with this horse. Thomas has been riding for a long time with Zyraldine, but due to injury she can not compete in the sport anymore. We wanted Mirelle to create this portrait since we had seen many beautiful portraits created by her. 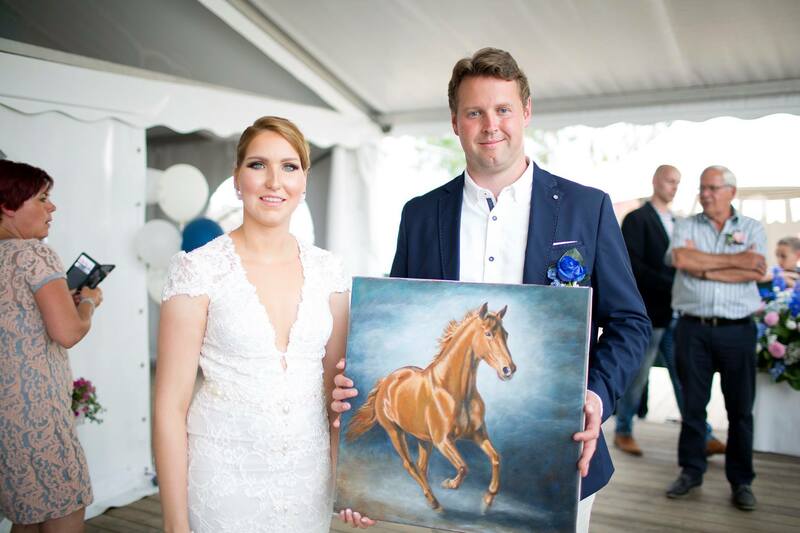 We received this portrait of Sanne's parents and sister as a gift for our wedding. Mirelle came to see us an meet Zyraldine in real life and to take pictures of her. We had a lot of contact and reviewed all phases of its progress together. 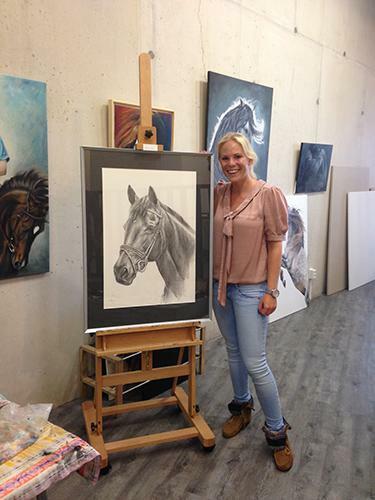 Sanne has been over at Mirelles' studio with her sister to view the painting when it was finished. We are very pleased with the result. The way Zyraldine has been portrayed in the painting is very real and shows the horses' character very well. 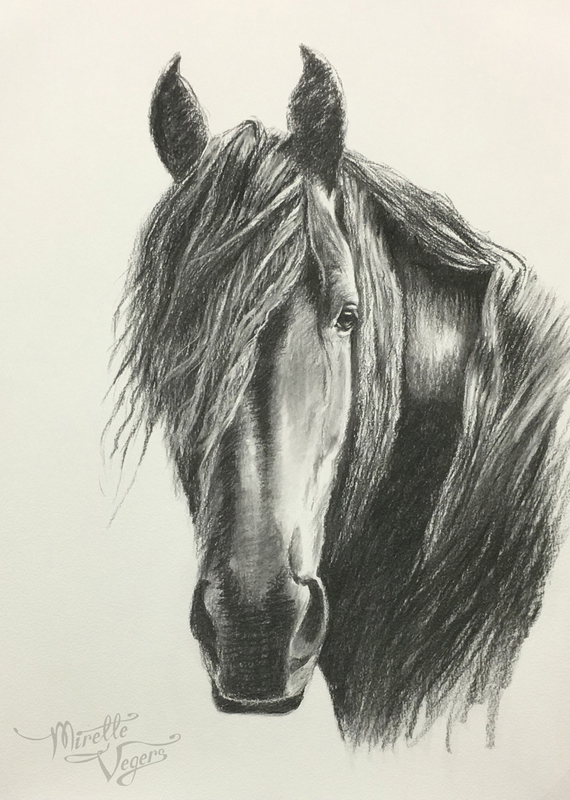 We would like to have more horses portrait by Mirelle later on in life. 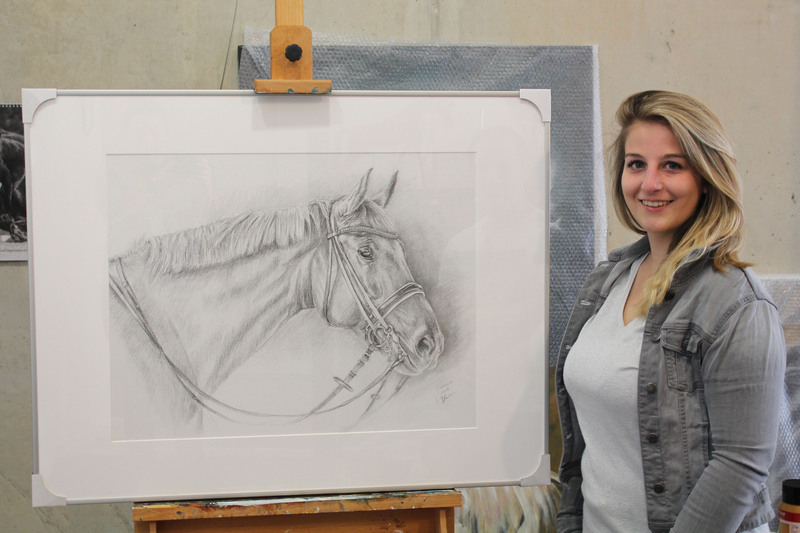 I'm Jorieke Meijer, I live and work on Texel and got the drawing of my horse as a gift from my boyfriend Rik. Unfortunately, in September 2015, I had to say goodbye to my cracker horse Burberry Brown, or BB if you will. After so many wonderful years together and a great competitions with BB, my boyfriend Rik wanted to give me a special gift in memory of BB. He showed me Mirelles' website and I was immediately sold! I had absolutely no objection. Of course we had to consider the pricing very well but it was totally worth it!! Every day as I enter the living room, my eye is immediately drawn to the beautiful drawing of BB. The drawing received a beautiful spot and I remember the wonderful moments we had together. The drawing is of great value to me and it is nice to think back to my experience with BB because of this drawing. Mirelle involved us in the creational process, the experience was very good. During the process, we got sent photos with updates on the progress of the drawing and I still remember the indescribable feeling that I felt seeing that first photo. And with every picture that followed that feeling became more and more fantastic. When we picked up the drawing at Mirelles' studio and when we saw it for real it was a very emotional moment. It is because this drawing is so lifelike that it's just like BB is with us again. I am very pleased with the end result! I'm Lies Gloudi and live in Rotterdam. Unfortunately with being so busy at work it has left me without a horse for now. Horses have always been a part of my life. I have worked with horses for 1.5 years in Qatar. My greatest love is and still remains to be Isha. My first own horse I have been able to experience a lot of joy with for over 10 years. Unfortunately, I had to put her to sleep a few years ago and I still feel the loss. Fortunately, she is visible every day now and a little more close by due to the portrait Mirelle made. It has been residing for a few years now at the dining table in the living room. I really wanted to bring Isha back to life a little. To get her back more then just besides the memories. And it worked! Before i wondered if it would not just be a beautiful drawing of a horse, but no, it's really my Isha. She not only radiates her kind personality but also her cheekiness. In short, a portrait with character. Now I even think about having an oil painting of Isha by Mirelle ... who knows. I started riding at 9 years old and I was 19 when I got my first horse. From that time on, I wanted Dooby portrait, but everything I encountered was too expensive for me so I couldnt do it. Dooby made it to 21 years old and then another horse came along, Ulia.V. A beautiful mare with whome I was equally in love with. And then another love came into my life, my dog DJ. I wanted all three of them portrait onto canvas. But I thought that this would be to expensive for me. If one even was too expensive, what would it be with three portraits! I came across a painting of our Dutch king Willem Alexander on his horse on Facebook. I really looked at it with admiration. So beautiful and with so much emotion. I thought "this is what I want". I got the nerve to just call Mirelle. There was an immediate connection and I felt that Mirelle was very a highly sensitive person and that appealed very much to me. Mirelle came to my home and brought several of her original pieces along with her, because I had not been able to go from my home for almost four years because of an accident I have had. I thought it was wonderful she did this just for me! 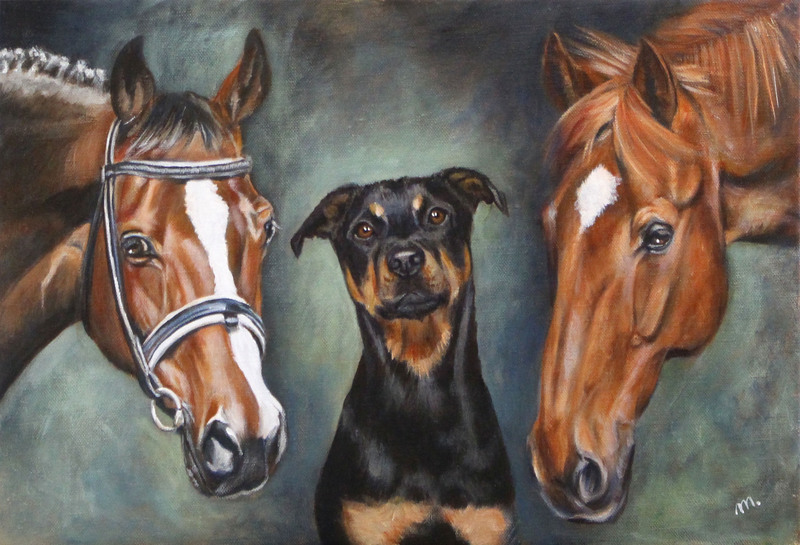 I wanted to have both my horses and my faithful dog on one canvas. We summarized and discussed everything. We came to a great agreement which suited me well. Meanwhile, the painting is done and resides here at my home in a beautiful spot. They all look so real! I have my best friends back. I can not describe how grateful and happy this makes me. It means so much to me, all three of them are painted with so much feeling and love. You'll really see and feel it. I HAVE MY BEST FRIENDS BACK. I'm Anneliek and I had received a gift from my sister, a "horse-in-a-box" (ink drawing in a sigar box), made by Mirelle. When my sister's horse died this year, I did not have to think twice... 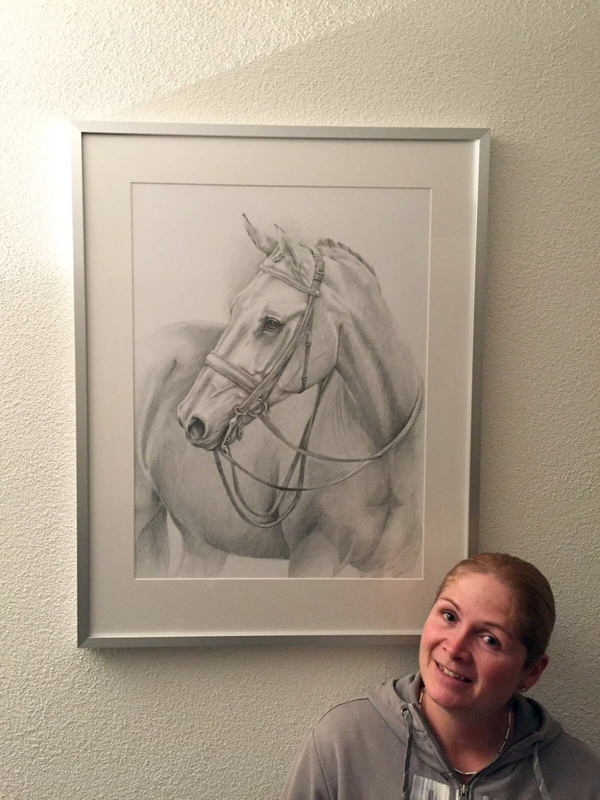 I wanted to have a portrait of her horse made for her. Mirelle thought very well about how and what this should be. It was quite difficult because it was a deceased horse and thus only remaining photo images could be used. The end result has become really beautiful and my sister finds it almost painful to look at it, such is the quality of the resemblance to her Romka. All in all, it was absolutely worth it's price! I am Greetje Fuhler, 38 years old and employed at the office in Germany as retail account manager. 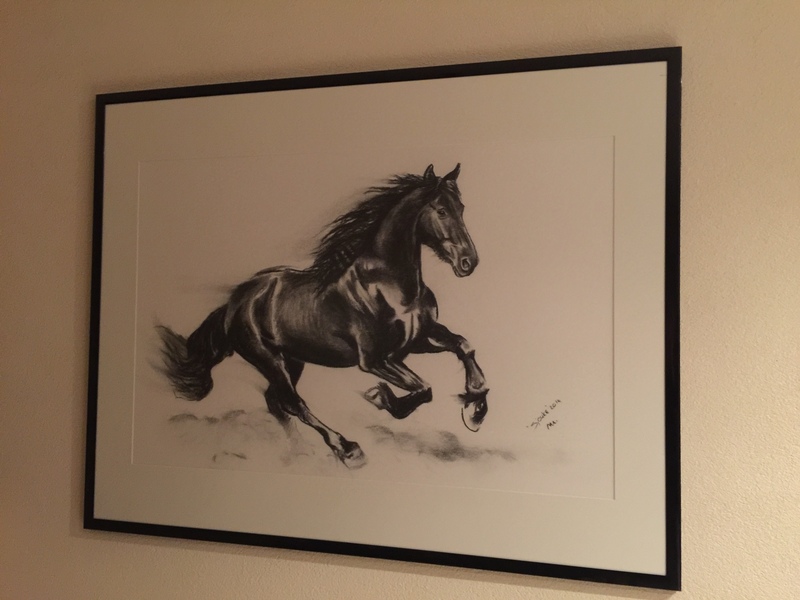 I really wanted a beautiful painting of my black pearl called Sjouke. This is my first Friesian horse who has a very special place in my heart. I wanted to capture this in an artwork and, after searching, I found myself on the site of Mirelle Vegers. The work she creates is just very special and the time she takes to bring back all the details in the art piece is just amazing. She expressed Sjouke in action on paper with charcoal. You can very clearly see his expression and power, really very beautiful. I have the painting in our kitchen where it really comes into its own. The nice thing about Mirelle is also that you an open converstation about how to choose which form of expression is the most beautiful or best. You have a choice in a variety of options including oil paint, charcoal and others. I chose charcoal and I did not regret it. I have received so many beautiful reactions to the painting. I'm still looking at the artwork every day and I really see Sjouke. If I would ever want another artwork made then there's only one artist for me and that's Mirelle Vegers! Once at a dressage competion a nice picture was taken of the greeting of me and Wiesje. But unfortunately, the background wasn't very nice. I've always said: that picture I would like as a painting. But I had already informed and because of pricing I kept putting it off. Wiesje was my very first competition horse. With her I actually won almost all of my competitions and it was even surprising if we did not win a price. It was a great teaching horse with a character of gold. Together we have come to the fore (most) achievable. Partly thanks to that experience, among other things, I mainly train young horses now. Because her class ZZ light was the highest obtainalbe for her, she was be able to enjoy an early retirement. But she was still in top shape! For a long time I thought about having something created with that picture until I contacted Mirelle via Facebook. Super spontaneous woman, connection, thinking with you and understanding what you want. You can see in her work that she creates her art with so much love and passion. From our good conversations, it became clear to me that she is a perfectionist. It felt good to have her create 'my' drawing. I opted for a drawing because I could not afford an oil painting. Also I find a drawing to just have a little bit of extra to it. I found this to be a good compromise. I also had it framed by Mirelle. She requires about your taste and on she presents you with a suggestion. I am very happy and grateful for the wonderful end result. Unfortunately, I had to say goodbye to Wiesje on September 16, 2016. So now the drawing is even more precious to me!